As we honor the fine men (and some greatly appreciated women) who served in Vietnam on this Memorial Day, it may be time to reassess the conventional wisdom that led Congress in 1973 to betray their sacrifice and caused generations since to believe the Vietnam War was a “senseless” and “unwinnable” war. Put simply, we need to revisit the debates that so divided and traumatized this country four decades ago. This is in reality a common theme among prominent anti-Vietnam activists. In 2000, we sought to “recycle” the old constitutional and international law debates about the war in connection with a conference at the University of Virginia Law School on the 25th anniversary of the fall of Saigon, and we were turned down by at least a dozen of the top scholars who once had vehemently opposed the war. For anyone who has kept up with events in – and modern scholarship about – the war, the reticence of the Schlesingers and Haydens to debate is more than understandable. After the war ended in 1975, Hanoi, through both its public statements and its actions, repeatedly has undermined the mythology upon which the protests were founded. For example, in the May 1984 issue of Vietnam Courier, Hanoi bragged about the once “absolute secret” decision on May 19, 1959, to open the Ho Chi Minh Trail and secretly start pouring countless tons of supplies, weapons and troops into South Vietnam for the purpose of overthrowing its government by armed force. That was more than five years before the U.S. responded seriously with U.S. forces. The biggest differences between our actions in Korea in 1950 and Vietnam 15 years later were that the communist armed aggression was covert and Hanoi ran a truly brilliant political-warfare campaign to mislead the American people into believing our cause was dishonorable. Perhaps the greatest myth of the entire war was that it was “unwinnable.” To the contrary, as many scholars and experts have long recognized, by 1971 or 1972, the war was essentially won in South Vietnam, and by December 1972, Hanoi’s will was broken in the North. The 1968 Tet Offensive, portrayed by most of the media as a great communist victory, in reality was a disastrous blunder that even the North Vietnamese defense minister, Gen. Vo Nguyen Giap, admitted was a major communist defeat. It cost the communists virtually the entire Viet Cong infrastructure and most of their guerrilla forces: An estimated 14 communist soldiers died for each American or South Vietnamese soldier killed during the offensive. Thereafter, almost all of the major fighting had to be done by North Vietnamese regulars. When Congress in August 1964 – by a combined vote of 504-2 (a 99.6 percent margin) – enacted a law authorizing the president to use military force in Southeast Asia, it did not even mention “South Vietnam” but rather authorized the use of armed force to defend any “protocol state” of the 1955 SEATO treaty requesting assistance. Those protocol states were [South] Vietnam, Cambodia and Laos. Thus, when U.S. forces were ordered into Cambodia in 1970 to attack North Vietnamese and Viet Cong sanctuaries, that action was fully consistent with the congressional authorization. Put simply, American forces were not defeated on the battlefields of Vietnam. Indeed, we won every major battle. But in May 1973, misinformed and angry congressional liberals snatched defeat from the jaws of victory by making it unlawful for the president to expend any Treasury funds on combat operations “in or over or from off the shores of North Vietnam, South Vietnam, Laos or Cambodia.” When North Vietnam’s Premier Pham Van Dong learned of that, he remarked: “The Americans won’t come back now even if we offered them candy,” and Hanoi sent virtually its entire army behind columns of Soviet-made tanks to conquer its neighbors. By then, U.S. combat forces had been withdrawn, and they deserve none of the blame for the ultimate defeat. That was the work of Congress. After the Korean War, President Eisenhower cut back military manpower and served notice on Soviet Premier Nikita Khrushchev that future communist aggression would result in massive retaliation – threatening to use our nuclear arsenal to keep the peace in the event of another Korea. It worked with Moscow – at least until the Soviets developed their own deliverable nuclear force and the question became whether America would risk nuclear attacks on New York and Washington, D.C., in order to preserve Saigon. “Comrade Mao” in China was not so easily deterred, and he argued that while in appearance the “imperialists” were indeed very fierce, in reality it was the “people” who were powerful. By using “people’s warfare” (aka “wars of national liberation”) the communists could send in trainers with money and weapons and promote internal revolutions around the Third World in which guerrillas would live, eat and work among the people. Nuclear bombs would be useless in countering this unconventional and asymmetric warfare, and “armed struggle” could continue despite American nuclear power. Keep in mind that in 1965, China was providing advisers, money and weapons for guerrilla movements in South Vietnam, Laos, Cambodia, Thailand, Indonesia, Malaysia and as far away as Mozambique in Africa. Thailand and Indonesia were vulnerable political and economic “basket cases” then and easily might have fallen to communist forces had the United States simply walked away from its solemn promise to defend the non-communist countries of former French Indochina. By staying the course, we bought time for Thailand and Indonesia (two very important countries) to become stronger – and during the war, China went through the Great Proletarian Cultural Revolution and turned inward. By the time Congress actually threw in the towel, China was no longer actively exporting revolution. No one can be certain what might have happened had we abandoned our promises earlier. But it is not difficult to envision a rather alarming scenario in which an American withdrawal would have been followed by communist military victories in neighboring countries and even by non-communist groups throughout the Third World turning to China, Cuba and other communist states for assistance in gaining political power. Non-communist Third World leaders might well have concluded America was an unreliable ally and sought to cut the best deal possible with their communist opponents. The Free World might soon have found itself facing a dozen or more “Vietnams” in Asia, Africa and Latin America – left with the choice of watching them fall one by one or responding with nuclear weapons. The story would not likely have had a happy ending for America or the cause of human freedom around the globe. 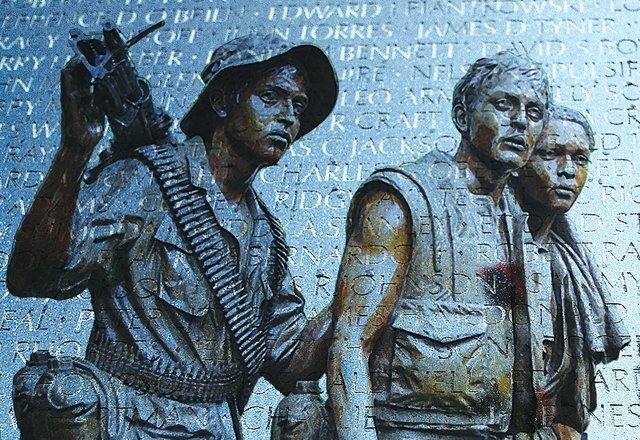 So if you encounter a Vietnam veteran today, at the Mall or elsewhere, take a moment to say, “Welcome home,” and, “Thanks for your service.” It is an expression of gratitude that is long overdue. Robert F. Turner served in Vietnam as an Army lieutenant and captain and for more than two decades has taught seminars on the war at the University of Virginia.